Have you ever looked at a photo of yourself and wondered who the fat old person staring back at you was? If that sounds familiar then the Slimming mode included in HP's latest compact may appeal. Be warned, though, it's a torturous process of menu hopping to apply that fat button and you'll probably need a snack when you're finished. Yes, it can shave a kilo or two from someone's frame, but don't expect miracles. To be fair, HP isn't making a big deal about this special effect, which is included along with other visual fripperies such as borders, watercolour and many simple effects that are often applied in Photoshop. So why not leave them out and let people do the silly stuff themselves? Well, the truth is, many people can't or don't want to mess with Photoshop; they simply want to take a photo, add a special effect and print it out. And that's exactly what they can do with this modestly priced 20MP compact with its 3x optical zoom and whopping 3-inch screen. This is a camera for people who want to take snaps and maybe have a bit of fun. And, as far as it goes, that's exactly what this stainless steel beauty provides. It's a neat piece of engineering with a dock for connecting it to a computer. The rechargeable lithium-ion battery is good for around 220 shots between top ups. Unfortunately, you do have to use the dock to recharge so that's another piece of clutter for the holiday suitcase. Frankly, putting a 20MP sensor in a camera aimed at this sort of user is a bit daft. The lens will strain to resolve enough detail and the sensitivity levels have been capped at ISO 400, presumably to cut down on noise levels. It does this reasonably well thanks to a largish sensor and some serious noise reduction. It produces fairly decent snaps but don't expect a huge improvement on a 7MP compact. The R967's sleek silver body is definitely up to HP's normal solid build quality. 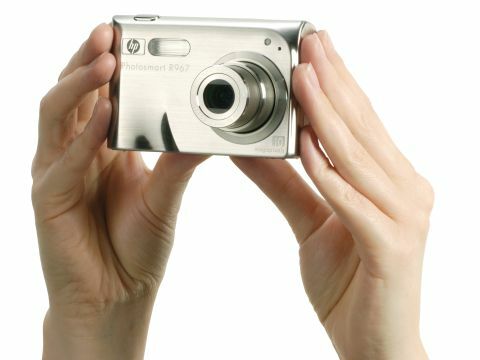 It feels well put together and a world away from the clunking boxes HP used to pass off as digital cameras. Start-up time is good at 2.5 seconds and the shutter lag is quoted at 0.25 secs. We found it perfectly usable for all but the fastest action. Compared with most other compacts, HP opts for a user-friendly menu that holds your hand and explains stuff clearly as you scroll through it. The number of modes and options is extensive and this does make things a bit heavy going. All the usual HP favourites are there, including the excellent panoramic stitching feature, Adaptive Lighting Technology and red-eye removal. Annoyingly, some of the settings revert to defaults each time the camera is switched off; we were constantly having to turn the flash to Off just to stop it firing in daylight. Look around the rear and you'll find that huge 3-inch screen. It's bright, but does tend to turn grainy in low-light levels. Sadly, as we find with so many cameras these days, there's no optical viewfinder, so you'll just have to pop a black cloth over your head if it all gets a bit too much. The review function on the R967 is, unfortunately, achingly slow and the first glimpse of a photo will look horribly dark and underexposed. It only appears normal once you switch into Review mode, which is very frustrating indeed.